I heard SRK saying this in one of his interviews, when he spoke about his father teaching him these lines, explaining the meaning behind it. Only those people can fail who have the guts to try. Those who don’t, they do not fail, but neither do they succeed. Be it reel or real life, SRK has always taught us to be positive and work hard no matter how negative the situation is. His own life is a brilliant example of fighting against odds and coming up on the top. Had he quit at any of the tough spots, the geography of the Indian Film Industry would have been completely different. He lost his parents very early, he came to Mumbai all alone, not knowing anybody in the industry, put in immense struggles and hard work and became the King of Bollywood. His journey of life might look like a dream right now, but the hardships he faced were not dreamy at all. And yet, the bad phases could never pin him down, ever. He has always come back stronger than ever. But his biggest achievement ever, has been the goodwill he has managed to create for himself, in the industry as well as with fans. He has the gift of being able to connect with people. This is something he believes in and proves it time and again. SRK is called King Khan not only for his box office records. And anybody who might be thinking that is extremely mistaken. There is just so much more to him that makes him the King. So it’ll be too foolish to judge him depending on the business of his films. People who are right now complaining about his choice of experimental movies should not forget that he is that person who has ALWAYS taken risks. And it is because of these risks, he became King Khan. As he says, people call him the “King”, if he won’t take risks, who will? In his journey he has seen amazing Box Office highs. And we fans have celebrated proudly whenever a film does well. But just like him, we hold the not so successful movies more close to our hearts. Because that is where we know is the “risk that went wrong”. And that it is ok for it to have gone wrong. Some choices will go wrong because that is just how it works. But he is the King at the end of the day and he can afford it. What needs to be seen and learnt here is that he still does not bow down to pressure of confirming. He still believes in his heart, in himself, and that just make us love and admire him even more. Nowadays, many are thinking that his fans are going to leave his hand in this tough time. Many others might even be rejoicing thinking that his followers will reduce. CORRECTION ALERT!! We are not going anywhere. I don’t understand how this can even be a possibility. And I really pity the people who are hoping for this to happen. Those who still have a doubt, please come outside Mannat this year on his birthday. I am confident that there will be even more people this year than ever before, in front of Mannat waiting to have a glimpse of their Superhero! Yes I can also assure you that there’ll be fans from 40 different countries in that huge crowd. I’m confident enough to claim so, because Shah Rukh Khan is not just a name, he is a belief. He is not just Raj, Rahul or Harry. He is an inspiration. He is motivation. He is peace, he is happiness and he is love. And all these things cannot be calculated with some box office numbers. 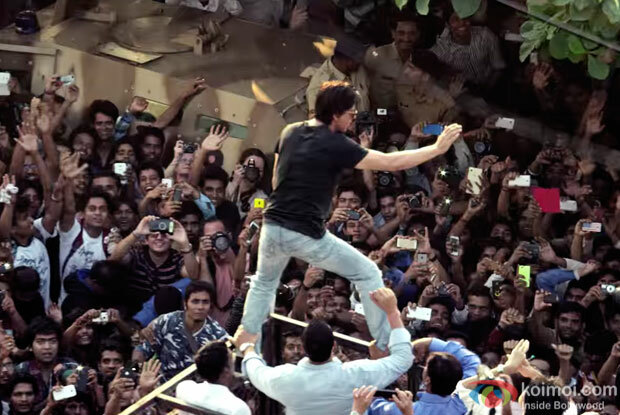 Anybody who is rejoicing saying “He is over”, it just means that you have never understood who Shah Rukh Khan is. Shah Rukh Khan can never be over. He is the one who NEVER gives up. He is the one who keeps on fighting till he wins. For his fans, for himself. He is THE King after all. I am a fan of SRK for over 18 years I live in Colombia and I watch their films 1 or 2 years later I have never felt that they are bad, for me as their Fan of Heart are all wonderful, they may not all be great box office hits Matter, the KING will always be the KING. And if many of your enemies think that we are going to leave their Fans for this, they are very wrong, we will always be at your side in the good and the not so good, that is to be a True Fan. Rocio Gomez Villa Manizales COLOMBIA LOVE SRK.